Oh me, oh my. What a tangled web we weave, when first we practise to deceive. Have I just watched The Wailers? I think I have, but it required a degree of mental flexibility, upfront, to convince myself of this. The present line-up of The Wailers features Aston Barrett, Jnr., on drums; the son of the legendary Carlton Barrett, drummer with the Wailers at the time of Marley’s death, and, let us not mince words here, an amazing drummer. To be a proficient reggae drummer is to understand rhythms within rhythms and to use percussion in a way that is just other-worldly. To be expert at this is to be one of very, very few. To be in direct bloodline to this remarkable musical collective is to be unique, especially given that his father was murdered in Jamaica in 1987. The sadly deceased Carlton’s brother, Aston, is generally referred to as ‘Familyman’ due to his organisational skills in getting the band together following Marley’s untimely death; a label he earned sometime before fathering what are claimed by some to be 52 children. And he’s only 71. He was/is the bass player who provided the ‘thump’ behind so many of the Marley biggies; indeed the combination of the two brothers could pretty much be described as the reggae version of Motown’s legendary Funk Brothers, having worked with Lee ‘Scratch’ Perry as part of The Upsetters. They were very much the nucleus of the musicians who became Bob Marley’s backing band, along with vocal back-up from the I Threes, when the original Wailers split in 1974. But Aston is pretty much confined to a wheelchair tonight, and bass duties are largely being looked after by ‘Dreadie’ Reid. The main focal point and powerhouse in all this, though, is Junior Marvin. Recruited to And The Wailers in 1977 after working for Island Records on a Steve Winwood project, he featured on the majority of those later Marley jukebox hits and he was very much the right man in the right place at the right time; and in fairness it is pretty difficult to see how the 2018 incarnation of The Wailers could function without him. On stage and in the context of a gig which might be described as ‘challenging’, he certainly emerged as nominal band ‘leader’. Donald Kinsey adds the ‘rock’ to Marvin’s reggae chops. Not only has he toured with Bob Marley and the Wailers and Peter Tosh, he’s toured with the likes of blues legend Albert King amongst others as well – and his rocky roots are very much in evidence when he cuts loose on one of many deft and sinuous solos. And to top this off, singer Shema McGregor is daughter of one of the original I Three; Judy Mowatt. And the front man, in the eyes of most of the audience having to shoulder the mantle of Bob Marley for the night, John David Barrett, is a distant relative of Aston Barrett. Live audio engineer Dennis Thompson is on keyboards of various kinds and knobs and twiddly bits and he is the guy who was largely responsible for ‘that sound’ on the band’s output and on tour in the seventies. His importance to The Wailers is – and was – as Billy Preston to The Beatles or Ian Stewart to The Rolling Stones. 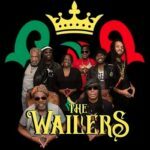 What sort of deal do you have to make with yourself before going to see The Wailers in 2018? Well, the first and most important part of the deal is that you have to accept that Bob Marley Is Dead. Get Over It. That part of the deal is particularly important. It’s a bit like going to see The Blockheads since the death of Ian Dury. So, what are we left with? An impressive body of work, great songs captured on memorable recordings and a collective of musicians with the spectacular skills, passion and desire to carry the music forward in a live context. Like it or not and as time goes by, we will see more of this. Ageing or ill members of bands will step down, or will just leave, to be replaced by other musicians who have earned the right to take their place, and we will be in a situation where we will be paying very straight-faced money to see a band with a particular name, with none of the ORIGINAL members, but with member or members who joined the band later in life, but are still part of the band’s organic development. This is by no means far-fetched. And sometimes it can work out very well, and mean that the music goes forward into the future. Dr. Feelgood is an honourable example of this. And what’s the alternative? The music dies in a live context with the death of the main man or woman? Is that what we REALLY want? Maybe it is. Maybe it isn’t. You pays your money. Or you doesn’t. Well, I did and after a delay getting into the venue I arrived just in time to hear the support band, Common Kings, playing their last tune. And the sound was positively hideous. The stage and all that surrounded it was reverberating with a horrible bass rumble that returned once The Wailers ambled into position. “Irie” was a booming mess, and a bemused-looking band stumbled into “Rastaman Vibration” with no great sense of commitment or confidence. Many meaningful looks were exchanged until part-way through “Buffalo Soldier”, Junior Marvin threw his guitar off and stalked to the side of the stage where a harassed – looking technician was engaged to try and do something about the awful mess, which was clearly driving Dennis Thompson, on keyboards, etc., for the night, to the point of distraction. And so it should have done. I really don’t know what happened between sound check and gig but…..anyway, you get the picture. Once the band had slipped into “I Shot the Sheriff”, (see what I mean? Do you REALLY never want to hear this again live and as intended?) things seemed to right themselves. This isn’t of course the case; someone on the desk would have been frantically rebalancing, re-patching, etc., but whatever and whoever did what, well done, because suddenly most of the clouds lifted and whilst the vocals were a little ‘muddy’ all night it did become a hugely enjoyable gig, with some qualifications. The band slipped into “Easy Skankin” before a show-stopping “No Woman, No Cry”. Having shots like this in your locker means never having to say you’re sorry. “Heathen” and then “3 Little Birds” had Manchester’s finest in full voice; especially when the band morphed the song into “One Love”. Put another coin in the jukebox. “Waiting In Vain”. And played so beautifully. The band pass vocals between Josh David Barrett, Junior Marvin and Dennis Thompson as well as I Two (!) and such was Marley’s vocal prowess, it took all of them to pull the trick, if indeed it is a trick, off. A funky, sweaty “Roots, Rock, Reggae” gives way to one of Marley’s most beautiful and enduring love songs – “Is This Love”, played and sung spookily faithfully and by now I have bought into Marvin’s assertion that in order to gain Marley’s blessing to carry on as The Wailers, they had to agree to make sure the music was played live as well as it had been; and a thoroughly stirring “Stir It Up” confirmed this. And by now the place is going absolutely berserk. Doubts dispelled, cynicism put quietly to bed with a warm drink and a good book. And then the band blasts into “Could You Be Loved”. And the whole thing falls over after about five seconds. Usually when something goes horribly wrong and a band stops dead after a few seconds, there is either an extended period of recriminations and swearing and the very public apportioning of blame, or a similarly extended period of forced smiles and giggling apologies, concentrated tuning up and associated farting around. But there isn’t the time for this and the musicians in the band know this. They’ve been on the road between them for probably approaching a thousand years and they know that at this point in the gig, especially if you’ve been fighting technical difficulties of various kinds, you have to strike whilst the force is with you; and indeed within about three nanoseconds we’re off again, all-important momentum maintained – and Friday night is saved for the assembled. The reception is rapturous and becomes increasingly so as they strike up “Jammin” and the place erupts. And that’s just about all for now, folks. The band wander off severally, some looking rather sheepish as if they’ve just about gotten away with it…..but in fairness they had far surpassed this. There were times during this gig where the band’s performance was little short of transcendental. It is a shame, then, when the band returns – well, some of them do – and simply perform “Redemption Song” before taking a bow. I know from the setlist drummer Aston Jnr. kindly gave me afterwards that the intention had been to play “Lively Up Yourself”, “Get Up, Stand Up” and “Exodus” amongst others but either one of two things happened. Either the band had taken to the stage later than they had intended and were caught the wrong side of a curfew, or because the technical problems, which diminished but never disappeared entirely, made it so that they really hadn’t enjoyed the gig as much as the audience clearly had; for the skeletal encore was rapturously received. But you can’t tour the album ‘Legend’ without playing ‘Exodus’. It ain’t my bandstand, but you just can’t. However, be that as it may, what a night they are. And you will end up telling your grandkids about this one, and you will probably subtitle your bedtime story ‘The Night I Saw Marley’s Ghost’. Or not. Been done before.